Content, search, conversational marketing and HubSpot's flywheel - we look at 7 key takeaways for marketing and sales from INBOUND 2018. Members of our Strategic team once again attended HubSpot’s INBOUND conference earlier this month in Boston. During INBOUND 2018, over 24,000 professionals descended on the Boston Convention Center to discuss the latest trends, developments and tactics in Inbound sales and marketing. Over four days, our team attended inspiring keynotes from experts including Deepak Chopra, Shonda Rhimes, and HubSpot co-founders Brian Halligan and Dharmesh Shah. There were also hundreds of breakout sessions to choose from, covering topics from the future of chat, to SEO, to content hacks. And, of course, there were plenty of new HubSpot product releases. We’ve broken down some of our key INBOUND takeaways here. Whether you’re sending nurture emails, communicating via social media or using a leadbot on your site, content remains the key to any inbox. However, several sessions this year focused on how to make your content work smarter, rather than harder, through repurposing and optimisation. Bridget Deutz’s session during Partner Day explained how the four-step ROPS process (Rework, Optimise, Publish, and Share) can save time and improve SEO ranking. Where keyword “cannibalisation” is occurring, it can be a positive tactic to merge blogs into a single longer post; many marketers are already opting to produce content which is around 1,500 words rather than 500-700. Indeed, reworking and republishing older content works well alongside a pillar page strategy, to pack an SEO punch. Where SEO used to be specific keyword-focused, search is now focused on topic clusters and concepts, rather than keywords alone. Semantic search assesses the intent and context behind a search query, so SEO professionals need to optimise content for semantic topics in order to build a stronger signal in SERPs. Upsana Guatam argues that there has been a shift in the meaning of SEO, stating that “we are no longer optimising for the search engine, we are optimising for the experience.” Topically relating content across a website - in clusters of pages that interlink - helps to establish a site as a topic authority. So, while keywords within a core topic still matter, SEO must now be considered in a more holistic way. CNBC reported this year that two-thirds of people who use digital voice assistants, such as Amazon Echo or Google Home, use their smartphones less often. It comes as no surprise then, that SEO professionals should now consider optimising sites for voice search. Taking semantic search to the next level, speakable schema is already here and can be implemented on your website for voice search. 30% of searches will be done without a screen in 2020, making voice optimisation a crucial part of any SEO strategy. Reducing content bloat was a common topic across several INBOUND sessions. The theme here, is that more content doesn’t necessarily equal more traffic, especially if that content doesn’t fit with the topic clusters you want to rank for. In fact, content trimming (removing irrelevant, low traffic content) could even boost your traffic significantly. When evaluating your existing content, you should consider its relevance (does it fall within the remit of your core content topics? ), traffic (is it generating meaningful traffic?) and links (does it have links from any external websites?). If your existing content doesn't meet these conditions then it’s actively hurting your ranking. Going forward, you should strive to create content that fits within a core topic, so that 100% of the content you produce helps you rank highly in search. Media Kix states that by 2020, the average revenue from messaging apps is anticipated to be more than £15 per user, driven mainly by chatbots. In his session this year, CEO of MobileMonkey, Larry Kim described messaging as “The Next Email!”. Stating that Facebook Messenger is a unicorn tactic - or growth hack - for the next five years, Kim highlights that users are more likely to open Facebook messages because they are a more direct channel of communication (and audiences will be served with a push notification). A Facebook Messenger blast could achieve a 60% open rate compared to the 20% marketers can expect from an optimised email. Web-based chatbots are also growing in uptake as marketers aim to provide frictionless experience for customers, with HubSpot announcing the release of their own chatbot this year. eMarketer predicts that by 2019, 65% of the global population will be on messenger apps. Video has been gaining momentum in the last year, with B2B sales and marketing professionals leveraging this popular content form to drive engagement at every stage of the buyer’s journey. Today, however, brands are focusing on making videos which are natural and personal rather than over-polished - to engage and connect with prospects and customers on an emotional level. Marketing automation platforms are adapting their offerings to make the delivery of content easier and with HubSpot announcing the release of HubSpot Video at INBOUND 2018, video features are now woven throughout the platform, encompassing marketing, sales and services. Marketers are optimising video for mobile consumption, and using it to drive engagement across social platforms, email campaigns, to kickstart sales conversations and more. Video is also becoming more important for search, driving a 157% increase in organic traffic from SERPs, according to Wordstream. Email is one of the marketing tactics most impacted by GDPR. More than ever, permission, progressive profiling and segmentation are necessary to ensure that you are delivering relevant, valuable, and personalised content to your audience. This year, in her session “How to think like a journalist and create better brand stories,” Melanie Deziel used the acronym “TRUTH” to highlight that good content should Teach, be Reputable, Unique, address Tension, and have a Human element. HubSpot CTO and co-founder, Dharmesh Shah’s Keynote also advocated that brands should be working to earn attention rather than steal it; the core of his message was the idea that businesses that solve for the customer and their goals, will grow better. This year, several of HubSpot’s sessions focused on the fourth stage of the Inbound Methodology: Delight. In his keynote session, Brian Halligan explained that delighting customers is essential for driving ROI, so organisations need to shift to a customer-centric mindset. 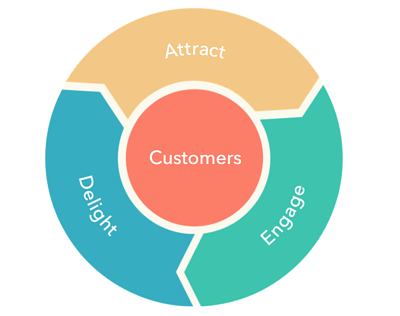 HubSpot’s flywheel ensures wider organisational alignment, and places the customer at the heart of the growth model, with Attract, Engage and Delight around the centre; this represents a circular process where customers feed growth (through referrals, testimonials and recommendations which are invaluable to your business) and emphasis is placed on delighting current customers. Ultimately, the key takeaway from INBOUND 2018 is a recognition that we are moving from a product-based era into a customer-experience era, where customer success and satisfaction is directly linked to growth. Consumers today expect everything to be instant - “I have the patience of a squirrel on its second expresso,” said Halligan - so superior customer experience is what differentiates a brand from the competition. Organisations who work to remove friction from the buyer’s journey, and make this a priority, will create more delighted customers - adding greater momentum to their flywheel and keep it spinning.